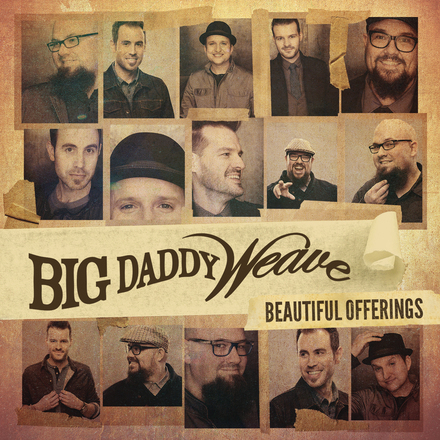 Christian music mainstay Big Daddy Weave is preparing to release their highly-anticipated seventh studio album Beautiful Offerings, set to debut September 18, 2015. "The Lord blew our minds in so many ways with how He used our album Love Come To Life," explains frontman Mike Weaver. "The song ‘Redeemed’ became a particularly special anthem. Being redeemed by what He’s done, we step into the identity that Jesus purchased for us. The bridge from that moment to now is the journey that we’ve been on to our new album Beautiful Offerings. In learning how to agree with what He says about us, the Lord shows us more of who we are in Him. The words 'in Christ we can do all things' introduce a brand new season of life. This album is about our learning how to move ahead in the knowledge that He has redeemed us to be Beautiful Offerings." Beautiful Offerings will feature 11 brand new songs, and a deluxe version of the album will also be available. Fans can get a taste of what to expect from Beautiful Offerings with the album's first single "My Story," which frontman Mike Weaver co-wrote with Jason Ingram. The single is at radio now with an official add date of July 17, 2015, and "My Story" will be available at digital retail outlets July 10, coinciding with the Christian retail pre-sale kick off. Big Daddy Weave will be prominently exhibited as part of a floor display in hundreds of Christian retail stores around the country in August. Additionally, anyone who steps into a Lifeway store this fall can expect to hear Mike Weaver featured on their in-store radio station. July 10, 2015 will also mark the release of Big Daddy Weave’s Live In Concert DVD and digital longform, available at physical retail and digital video outlets, including Qello. The live DVD was recorded in Marion, Ill., where the band will perform two back-to-back concerts on September 18-19, 2015 to celebrate the album's release and to kick off "Big Daddy Weave's My Story Tour" featuring Jason Gray and Citizen Way. The tour will run from September through November 2015. Big Daddy Weave will also participate as part of Christian Music Broadcasters’ Momentum 2015 Night of Worship on Wednesday, September 9, 2015 in Orlando.